LAWRENCE — The fate of stingless bees in Brazil is so important that University of Kansas researcher Chris Brown risked life and limb to survey the vital pollinators in the state of Rondônia, which borders Bolivia in the southwestern Amazon. Today, the peer-reviewed journal Apidologie published Brown’s hard-won results. Native to the tropics, stingless bees are cousins of honeybees. They are highly social, living in colonies, with queens and workers, where they store honey and pollen for food. Stingless bees evolved before the breakup of the ancient continent of Gondwana, some 150 million years ago, prior to the appearance of honeybees. Each species make their nests in a variety of cavities, like in old termite nests, the ground and living trees. 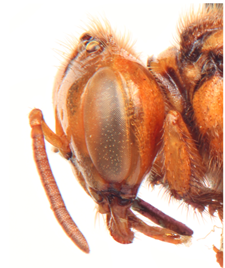 Over the course of a year, at 187 sample sites, Brown and his colleagues found 9,555 individuals representing 98 species of stingless bees. Ten of those species were entirely new to science. Alas, deforestation, agriculture and other forms of habitat destruction threaten stingless bees in Rondônia, the region where they display their richest recorded diversity. The KU researcher said the new research builds on a survey conducted in 1996. At that time, there already were highly deforested areas that had been settled by farmers from Brazil’s south, in addition to heavily forested areas. Brown’s collaborators included the late Professor João Camargo, who led the identification of specimens and naming new species. 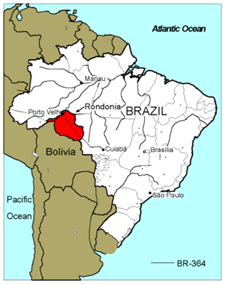 Brown’s co-author, Marcio Oliveira, is from the National Institute of Amazonian Research, and he was a post-doctoral scholar in geography at KU in 2010. The World Bank supported the research as part of the socioeconomic-ecological zoning of Rondônia.